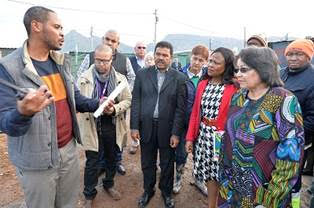 Today I visited Masiphumelele with the Public Protector, Busisiwe Mkhwebane, and the South African Human Rights Commissioner, Chris Nissen, to inspect and report on the work that the City of Cape Town is undertaking in the area. I invited the Public Protector to visit the area following our meeting at her office on 3 August 2017 and the Public Protector’s visit to the area in June. Masiphumelele is a severely overcrowded area and this has been exacerbated by urbanisation. As I have stated to the Public Protector and Commissioner Nissen previously regarding the overcrowding, I can understand that people want to remain in the area as they are close to where they work and other economic opportunities. Cape Town has more than 200 informal settlements, with many of the existing settlements continuing to grow. As a result of the high densities in Masiphumelele, in order to improve the conditions in the area and address health risks the City provides cleaning services seven days a week. There are many obstacles to providing services in Masiphumelele for a variety of structural reasons. Residents settled on the wetland area despite the legal impediments to installing electricity and sanitation infrastructure there, and the City has been in the process of systematically remedying this situation for many years. Despite the challenges the City is facing in the area, we are committed to finding sustainable and integrated solutions to improve the living conditions of the community through enhanced service delivery. Where gaps exist, they are being attended to and monitored consistently. I receive weekly reports detailing the specific cleaning interventions in the area and the City has further undertaken a campaign to communicate with residents directly in order to assist in stemming the tide of solid waste blockages in the area. Today I provided the Public Protector with a progress report as follows. The City is progressing with the R2,5 million tender for the construction of wash houses. The City envisages that the contractor will be on site in October 2017 and work is set to be completed in January 2018. The City has gone to great lengths to keep the area clean and the problem is not that we do not clean the area. We provide extensive cleaning services but the area does not stay clean for long and one of the reasons for this is that the bins in the area are not utilised properly. This poses a severe health risk to residents, especially children. We have enhanced the supervision of the cleaning services and we have appealed to residents of Masiphumelele, asking them to help us to keep the area clean as we are currently spending R1 million per quarter on cleaning services in the area. Despite providing refuse collection seven days a week and litter pick-ups on a near-daily basis, high levels of littering and illegal dumping means that the area is never clean for long. We have also shared reports with the Public Protector on how the work being done is being closely monitored and this includes photos taken before and after cleaning. I also informed the Public Protector about some of the projects that are under way and projects which will start in the near future. The City’s Transport and Urban Development Authority (TDA) is spearheading three major projects intended to improve the quality of life of those residents living in Masiphumelele. The construction of 227 State-subsidised houses is progressing well, as are the plans for a new minibus-taxi facility and the proposed extension of Houmoed Avenue. Access to decent housing opportunities and public transport improves people’s lives. Everything the City does is aimed at improving the lives of those in need. In Masiphumelele we are making every effort to better residents’ living conditions and access to job opportunities. The City is constructing 227 Breaking New Ground (BNG) State-subsidised houses on two erven in Masiphumelele. The R55 million project includes bulk earthworks, construction of civil engineering services, the top structures, electrical reticulation and street lighting. These two sites – one situated on the corner of Ntansiso and Ntantala Roads and the other in Myeza Road – form part of Phase 4 of the Masiphumelele housing project. The construction of the platforms that are needed for the houses, as well as the civil engineering services for the provision of water, electricity, sewerage and roads, should be completed within the next few weeks. We have issued the tender for the construction of the houses and the installation of electricity and streetlights on 4 August 2017. We are well aware of the dire need for housing in Masiphumelele and I can assure the community we are trying everything within our means to ensure that this project is completed as soon as possible. The City’s planning for this facility has been ongoing for some time. The tender for the construction of a new minibus-taxi facility will be issued within the next few weeks. The facility will be built on a section of the land situated on the corner of Kommetjie and Pokela Roads. We want to transform this space into a new public transport facility where residents will have a safe and dignified area for waiting and connecting with their fellow commuters. The facility will be equipped with a rooftop solar photovoltaic (PV) panel system for electricity generation and rainwater tanks. An admin building will be constructed where operators and management can conduct meetings and universally accessible walking lanes will provide safe and easy access to the facility. The minibus-taxi operators are currently operating from a vacant erf with no services or facilities for commuters and operators. About 3 300 commuters are using this informal taxi rank on a daily basis and are exposed to the elements – wind, rain, sun – while they are waiting for taxis. The new minibus-taxi facility will bring great benefit to residents. We are also investigating whether the rest of the site is suitable for a mixed-use development with a combination of business and housing opportunities. We will engage with the local community about this aspect as soon as we have more information available. The City is planning to extend Houmoed Avenue to provide residents from Masiphumelele with better access to the rest of the village and to make it possible for the South African Police Service, the Fire and Rescue Service, and ambulances to quickly access Masiphumelele in times of need or emergencies. Once completed, Houmoed Avenue will be wide enough for vehicles, with sidewalks for pedestrians and bicycle lanes. The City is planning the two sections and will engage with the residents of Masiphumelele about the extension of Houmoed Avenue. By extending Houmoed Avenue, we will be able to prevent flooding in parts of Masiphumelele because draining infrastructure will assist with diverting the water to stormwater channels. 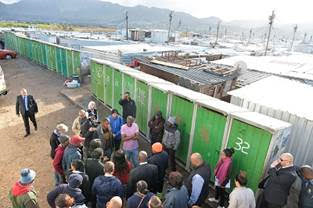 In terms of land availability for development in Masiphumelele, the City has informed the Public Protector that we are exploring a number of options, including making a new application to build housing opportunities on another part of the site where we are already busy with the Phase 4 development. A previous application to build housing on this site was turned down, but the City has notified the Western Cape Government Department of Environmental Affairs and Development Planning that we intend to reapply for development of this site. In terms of the plans to build a fire station in the area, the City is reducing the imprint of the fire station to make 87% of the land available for high-density formal housing. In order to address the housing need in the area, the City will look at building a range of housing opportunities in a high-density layout, with a mix of subsidised housing and Council rental units. I have reiterated to the Public Protector and Commissioner Nissen that the City is doing all we can in Masiphumelele, but the key is to address both the overcrowding and the issue of people living in the wetland by improving the living conditions of the people of Masiphumelele, through de-densifying the informal areas, provision of services, and at the same time providing formal housing opportunities (with increasing those densities). The City has previously appointed a mediator to facilitate engagement between the administration and the residents but the community did not accept this offer. At our meeting on 3 August 2017, the Public Protector advised that her office can act as a mediator. We welcome this and have asked for an update in this regard. Finally, I am making an appeal to all political parties not to exploit the situation in the area. When the City wanted to provide additional sanitation services with portable flush toilets, the community was incited not to accept it. Furthermore, out of desperation to keep the area clean, we have now printed pamphlets which we are distributing to residents appealing to the community to help us keep the area clean. One myth that must be debunked is that the City does not care about Masiphumelele. We have been working with the community and will continue to do so, but it is the political interference that is exploiting the situation which stalls progress. Ethics commission or Integrity Commission? An anti-corruption court and a TRC for the corrupt – really?